The current political conflicts in Somalia and Russia make the reappearance of this book as relevant as ever. 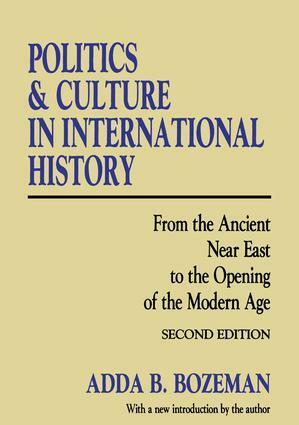 Politics and Culture in International History illumines world politics by identifying the causes of conflict and war and assessing the validity of schemes for peace and unity. Bozeman maintains that political systems are grounded in cultures; thus, international relations are by definition hitercultural relations. She deals exclusively with the thought patterns of the world's literate civilizations and societies between the fourth millenium B.C. and the fifteenth century A.D. In a substantial new introduction, Bozeman analyzes world politics over the last half century, showing how the interplay of politics and culture has intensified. She notes that the world's assembly of states is no longer held together by substantive accords on norms, purposes, and values, but by loose agreements on the use offorms, techniques, and words. The causes and effects of these changes between the 1950s and 1990s are assayed by Bozeman.